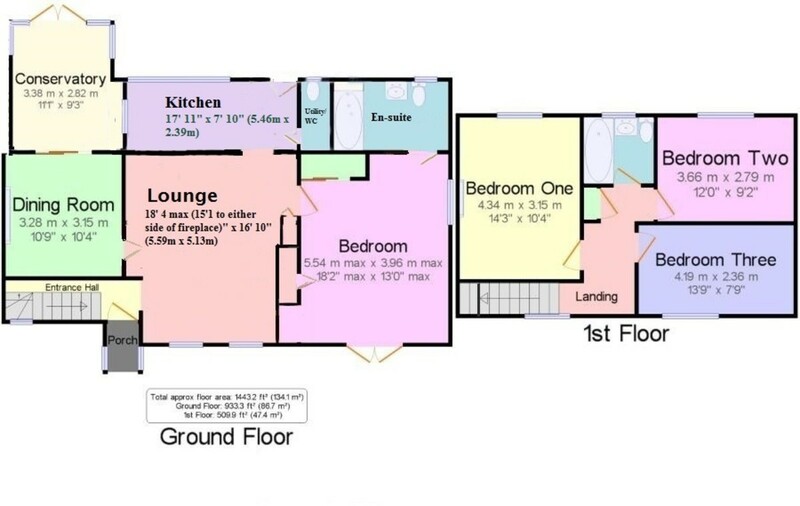 Good Sized Lounge, Kitchen, Utility/W.C. Conservatory 11' 11" x 9' 3" (3.63m x 2.82m) Brick and uPVC construction, polycarbonate roof, internal glazed window to kitchen, double glazed double doors leading to rear garden. W.C./Utility Room Tiled flooring, low level push flow w.c., double glazed obscured window to rear, corner wash hand basin with tiled splash back, wall-mounted mirrored medicine cabinet, space for washing machine and tumble dryer. En-Suite Bathroom Panel enclosed bath with glass screen, wall-mounted 'Triton' hand held shower attachment, low level push flow w.c., wall-mounted wash hand basin with mixer tap, part tiled walls, double glazed obscured window to rear, extractor fan, wall-mounted glass fronted medicine cabinet, tiled floor. First Floor Landing Cupboard with shelves, access to loft hatch with fully boarded loft area and shelving around the entire loft space. Bedroom One 14' 3" x 10' 4" (4.34m x 3.15m) Double glazed window overlooking rear garden, radiator, cupboard over stairs. Bedroom Two 12' 0" x 9' 2" (3.66m x 2.79m) Double glazed window overlooking rear garden, radiator. Bedroom Three 13' 9" x 7' 9" (4.19m x 2.36m) Double glazed window to front, radiator. Family Bathroom Panel enclosed bath with stainless steel mixer tap and hand held shower, glass folding screen, wall-mounted 'Triton' hand shower attachment, vanity enclosed sink unit with mixer tap, fully tiled, double glazed obscured window, wall-mounted mirror, low level push flow w.c., wall-mounted stainless steel heated towel rail, linoleum flooring, concealed spot lighting. Front Garden Gate accessed from Love Lane between North Street and Spierbridge Road, mainly laid to lawn with flower and shrub borders, enclosed by low brick wall and hedging, gated side access, brick paved path to front door. Rear Garden Mainly laid to lawn with attractive brick edging, paved patio area, paved pathway, flower and shrub borders, timber garden shed, outside water tap, gated side access to front. Directions From Fowlers Storrington office continue along North Street passing the library car park and follow the road as it bends sharply to the right into Spierbridge Road. Continue along Spierbridge Road as it continues to bend round to the left a pedestrian walk way will be seen on the left hand side which leads to No 32 (which is Love Lane).